Thank you for sharing--please keep us posted! The author of the original Manila album posted comments which were passed along (in English) in this blog (bottom of page), adding a second Manila location: Paco park. The Amazing Race 2 was sighted here in Manila last July 5 and 6, wherein the teams went under the Carriedo station for their detour. One which involves shoes and another which involves bike assembling. Marc Nelson, the local TV show host from Sports Unlimited was reportedly in the Race, representing the Philippines, along with an unpopular guy. The leg was said to be the second of the race. I hope Filipinos represent well this time. If S'pore is Starting line... my guess S'pore also is Finish Line.... but race through M'sia. Thanks. I'm wondering if the racer is obscured on the left of the photo; the cameraman seems to be aiming down the length of the counter, not at the white-shirts (probably airline types). The blog is no help; the last entry was 13 March. Yes, as best I can match it it's the small nook seen here at the Incheon (Seoul) airport (source). Is it possible both crews went to the same city? Slowhatch, my reading of the July 25 blog indicates that the event cited in Prague was several days earlier, since the writer had gone to Bratislava and Vienna subequently before blogging. 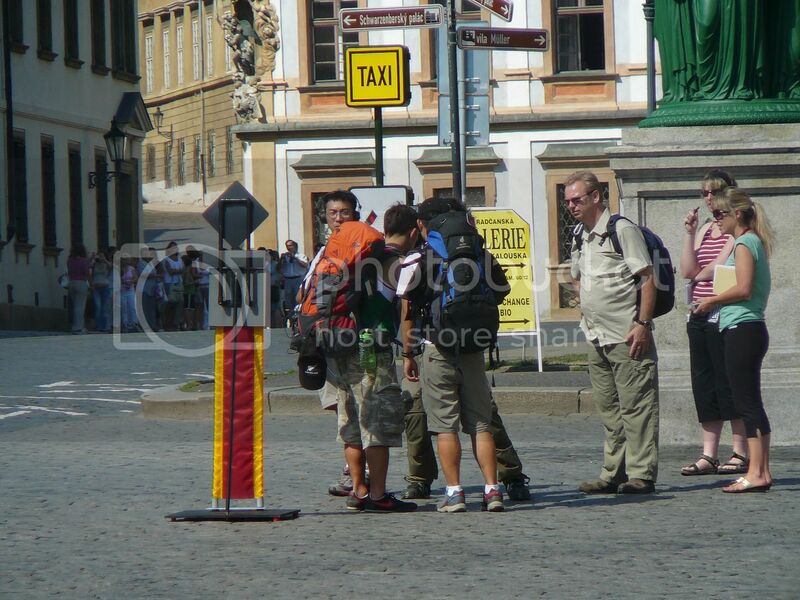 That means that the event was probably the same one on July 18 and not a second TAR landing in Prague. ADDED LATER - A careful rereading of Emma's blog suggested by later postings makes it evident that the Hradcany Castle filming that she observed was on the mornign of July 17. I think I will pass on that video to a friend of mine who might be able to figure out what beach that is. Don't you just love it when someone else does all the hard work and then gives you the credit? No need--but thanks! which does tie in perfectly with the 16th sighting from flobie33 . But the other one says teams seen on July 18th. Could be Pitstop? and another task? Looks like TARA for sure on the 16th, but what about the 18th? And I couldn't resist... I asked the blog guy for pictures! A full day of exploring Prague today, we had a walking tour from Hradcany Castle to Wenceslas Square, with many sights in between. 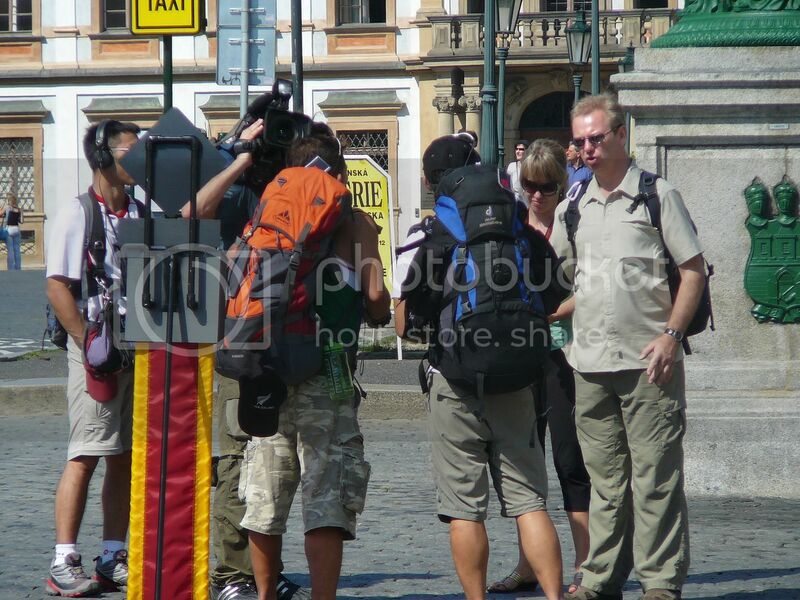 The most exciting was seeing The Amazing Race being filmed at Hradcany Castle. We got all excited and fan-boy-and-girly and raced over to take photos. The producer got angry and yelled at us but it didn't stop us gawking and snapping away. so to me this all did not happen on the same day, it seems to me A full day of exploring Prague today was emmas way of continuing her story. Good job trying to get those pictures peach!! Thanks. Is that an intersection sign above the cluebox? Yes, Slowhatch, your eyes do not deceive you. We are looking at the back side of an intersection sign with its classic diamond shape above a rectangular box. That guy with the orange backpack has a NZ "All Blacks" cap hanging off the bottom of his bag. They're the type commonly given away by the duty-free shops in Auckland airport. Nice catch. The sign for Kalouska galerie puts them somewhere in the vicinity of Hradcany square, but I haven't found the green statue yet (the signposts just point to nearby tourist attractions). I'm happy to help as much as I can, I just hope I can remember something good! The date we saw them was the 17th of July, the time would have been between 10am and 10.30am. It was at the Hradcany Castle Area, outside the entrance to Prague Castle, right below a big, green, ornamental lamp post. The two contestants were Asian, as were two others who arrived shortly after we saw them. The other two were both male, tall and one had a brown bandana/headscarf on. So I'm guessing it was TAR Asia. I assumed the guy with the blue backpack was a producer or something. The same goes for the woman in the red and white striped shirt. She was the one who told us off for taking photos. She's also checking with her friends to see if there are more pictures! cabio TAR, I agree with your line of thinking. At Prague, which was probably about the 7th leg(2nd being Manila July 6), I believe it is more likely that there would be 6 teams left than only 4 teams left. We are now 11 days later than Prague and probably 4 legs later and they should be down to the final 3 and close to finishing. I did puddin! and have invited her to drop in and say hi so we can thank her in person too! eta: Kogs! great Korea find!